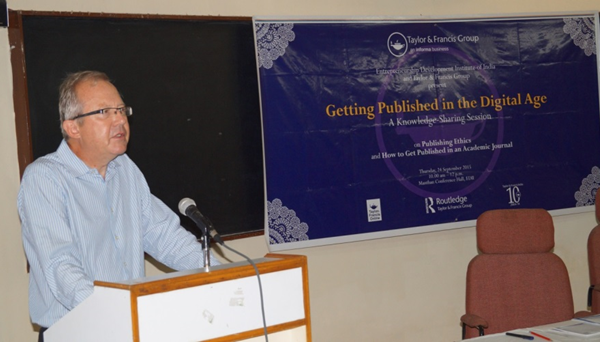 Getting published in The Digital Age 'Getting Published in The Digital Age' was the topic of the Knowledge sharing session at the Institute on 24th September 2015 which was attended by faculty members, academics, researchers and fellow programme students. Mr Gerald Dorey, Editorial Director of Taylor and Francis, also responsible for the journal program in India, shared valuable inputs on writing professionally in academics. Ranging from aspects as to why we need to publish to where and how to publish. Mr. Dorey gave insights in all. The interactive session addressed many versatile issues that have always bewildered academic writers. The Do's and Don't's were easy to comprehend and extremely valuable. This was followed by a presentation by Ms. Anindita Pandey, Regional Publishing Manager, Journals, on ethics - both mandatory and unwritten- that one needed to address in academic writing. She explained how carelessness and slightest faux paus could make one lose credibility and lead to other dire consequences. The participants appreciated the sessions and felt that such interactions would definitely encourage more academic writing.